Taoism, according to my dictionary, is "A religious doctrine originally based on writings attributed to the Chinese philosopher Lao-Tse, who lived around 500 B.C." According to Willie Nelson, it's "The Tao Te Ching is the work of several writers who were inspired by the teachings of a guy named Lao Tsu, who lived about six hundred years before Christ. But the idea behind the Tao are older still, and were very likely derived from some of man's oldest teachings". And, he says, "Tao is NOT a religion". 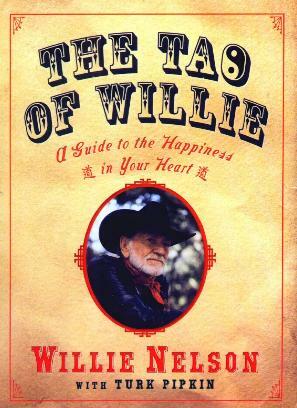 This might be true, for Willie seems to have been around for always. Willie Nelson is best known for his country music and his waist-length pigtails, not for his humor. His jokes are peppered throughout this book and reflect a pleasant aspect to his personality. His early lessons as a child have stood him in good stead and I only wish they were handed down to more children these days. Nelson tells of growing up in Abbott, Texas, picking cotton, learning to play the guitar, songs he wrote and sang, his golf game, Hawaii, biodiesel, and so much more. He offers much in how to be a good human being This is how I feel. I loved his passage, "I believe that all life is connected, and that there is beauty and value in all things. I believe that the truth is found in our own heart. The trick is to shut up and listen. The trick is to believe". Now this is the spirituality I believe in, and, no threatening Biblical quotes. Couldn't be simpler. I'd love to meet this man and learn more about him. Great, great, great advice. I have found a new best friend in Willie Nelson - he makes so much sense. Visit his website for more information. Conclusion - Everyone should read this book and learn more about Mr. Nelson's peaceful and practical way of living. The lessons are important to us all, especially if we want to be good human beings. I loved the Cherokee story on page 33 - it's that easy.